The festival Aeroflot Open dedicated to the 90th anniversary of the leading Russian airline was opened in the center of Moscow today. It's noteworthy that the opening ceremony of the "updated" festival greatly differed from the ones held in previous years in Izmailovo hotel. If describing it in three adjectives only, those should be: more expensive, more vivid and more impressive. If not taking into account 45-minutes waiting for the main guest of the ceremony, in general everything went remarkably quick. The chief coach of the Russian women's national team is in a good mood, but refuses giving a commentary. Arkady Dvorkovich eventually arrived dressed in an official suit, he chose less official outfit for the closing ceremony of Moscow Open held yesterday . "Thanks to Anatoly Karpov and Alexander Bach for previous Aeroflots, and now we're opening a new chapter in the history of the festival"
The chief arbiter Alexander Raetsky held the draw: Anatoly Karpov invited to the stage took out the black piece, which means the rating favourite Gata Kamsky will be black in Round 1. 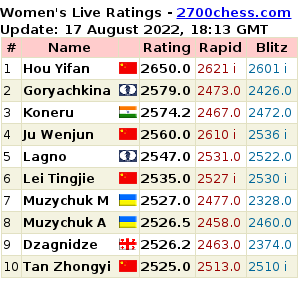 The first four rounds of the rapid tournament will be played already today at 11:00 CET. Yesterday was the rest day only for Carlsen and Anand: everyone else was waiting for Arkady Dvorkovich to arrive. 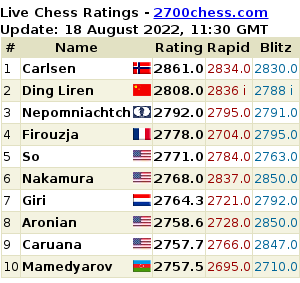 While the chairman of the organizing committee (and Deputy Prime Minister of Russia) was on his flight to Sochi, twelve invited GMs were fighting for the prize money of $100000 in the Tal Memorial Blitz.